Attach a stirrup (handle) to an elbow-high cable pulley. Grasp the stirrup with your right hand and step backward until the cable is pulled taut, your arm and shoulder are stretched forward, and your waist is rotated towards the pulley. Position your right foot in front of your left foot for stability. Your knees should be slightly bent, your right foot should be flat, and your left heel should be raised off the floor. Place your free hand on your hip. Keeping your elbow close to your body, exhale as you pull the stirrup to the side of your waist and rotate your body to the same side as your loaded arm. Inhale as you reverse the movement and return the stirrup to the starting position, with your arm and shoulder stretching forward and your waist rotated towards the pulley. Ensure that most of the rotation occurs in your waist and not your hips. Do not rotate your waist beyond feeling a mild stretch in your side. 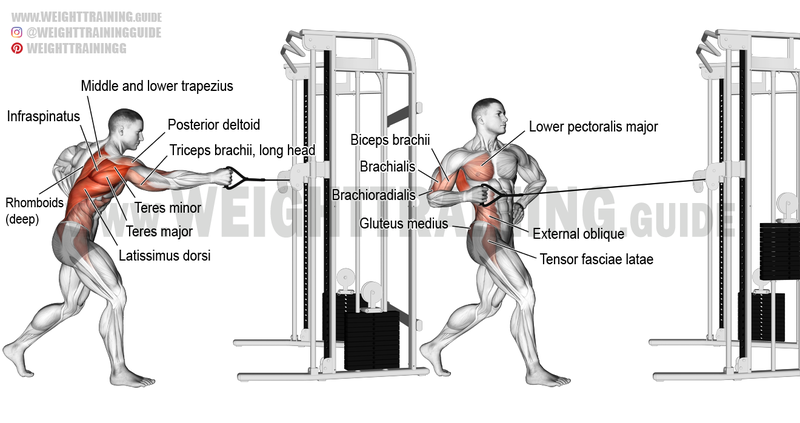 The standing twisting cable row is an effective exercise for developing unilateral upper-body strength, as well as improving core strength and stability. Try it using both the stance described above and the opposite stance to see which one you prefer. Note that the opposite stance will activate slightly different muscles in your thighs, hips, and gluteals. See also the standing twisting cable high row and the seated twisting cable row. Unfortunately, this is the closest video I could find to demonstrate the standing twisting cable row. It’s the standing twisting cable high row using the opposite stance. Finish back day off with this all the time. Use a low cable though. Really burns and leaves a good pump.